A post of mine, the 9 kinds of physics seminar, had gone viral. I was shocked, to the say the least. I spent some time investigating what happened. The original post went out on a Thursday, Oct. 3. Nothing much happened, other than a few likes from the usual suspects (thank you, John Zande!) I did share the post with Facebook friends, which include not a few physicists. (Note: I don’t normally share my blog posts to Facebook.) Then on Monday, Oct. 7, the roof caved in. It started in India. 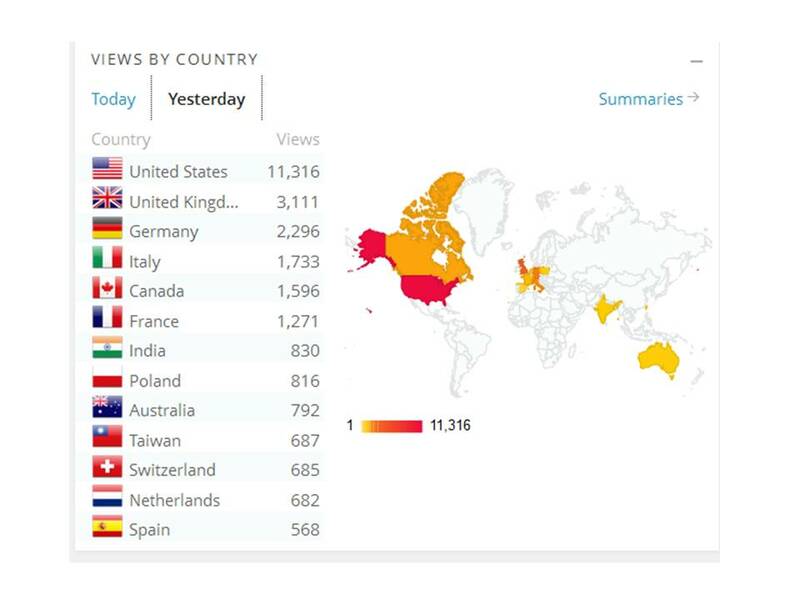 Monday morning, I had over 800 hits from India. My initial thought was that I was bugged somehow. But soon, hits started pouring in from around the world, especially the USA. And then it kept going. The viral spike peaked on Wed., Oct. 9. I had discovered by then that my post had been re-blogged and re-tweeted numerous times, by other physicists around the world. If you Google “The 9 kinds of physics seminar” you can see some of the tweets for yourself. Why did the post go viral? Who knows. I’m not a sociologist. I think it was a good post, but that’s not the whole story. More importantly, the post was funny, and it resonated with a certain segment of the population. If I knew how to make another post go viral, I’d do so, and soon be a millionaire. I don’t know anything, really, about viral cyberspace, but this graph totally matches my intuition. 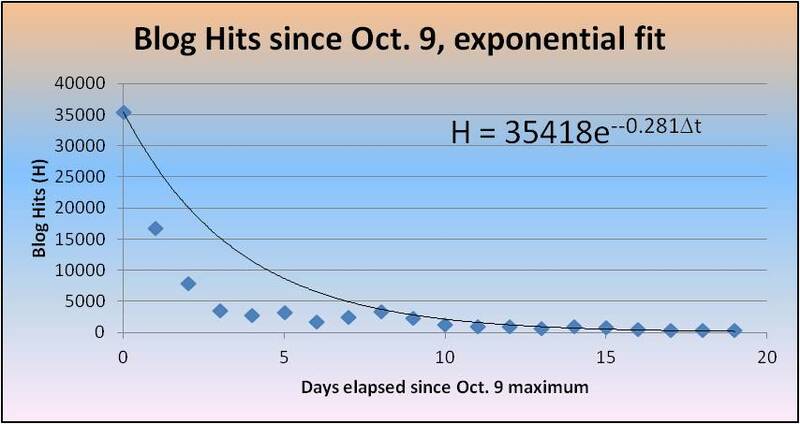 Note that for the last few days, the hits have been around 400/day, still much greater than the pre-viral era. The decay constant is 0.495, corresponding to a half-life of 1.4 days. 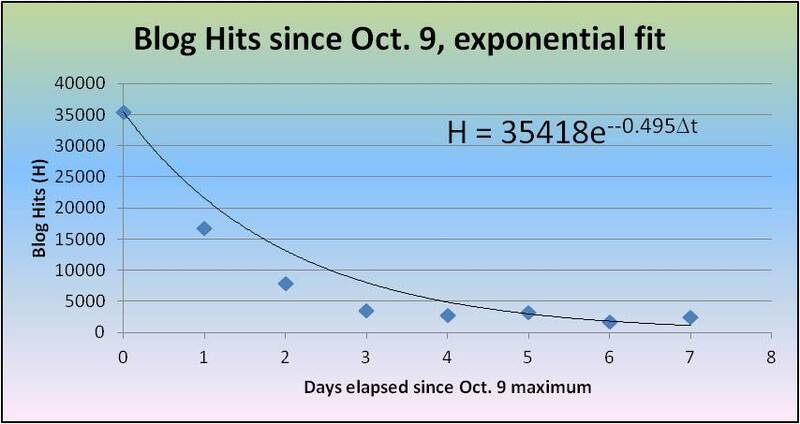 So after the peak, the number of hits/day was reduced by 1/2 every 1.4 days. 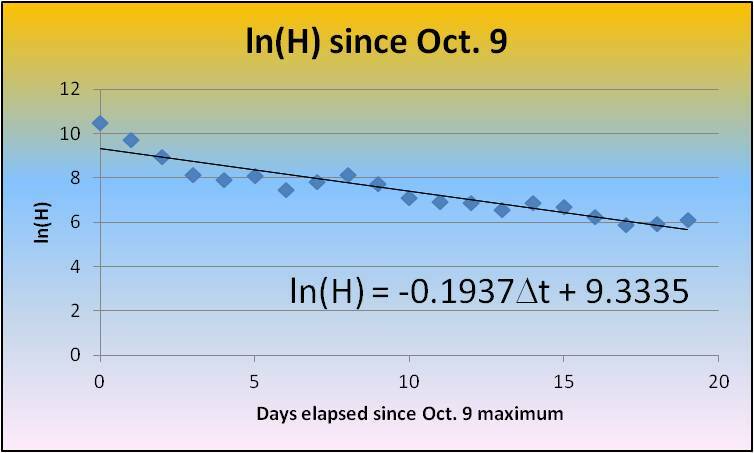 The long-term decay rate seems to be 0.1937, corresponding to a half-life of 3.6 days. 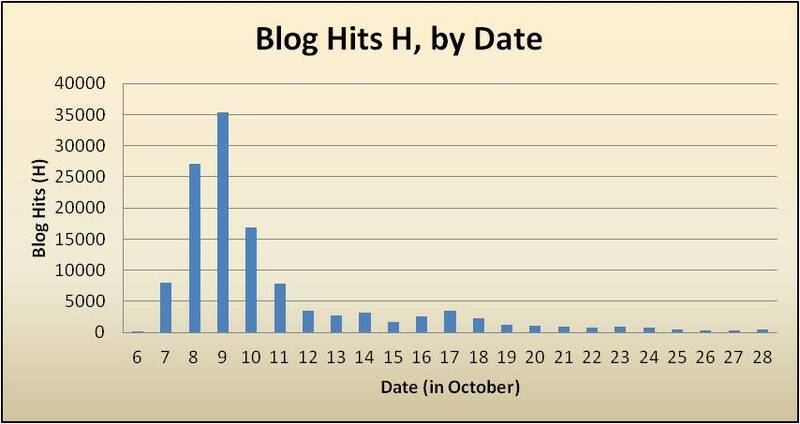 At this rate, you would expect the blog hits to approach pre-viral levels by mid-November. I doubt that will happen, since the whole experience generated quite a few new blog followers; but in any case, the graph should level off quite soon. What the new plateau level will be, I don’t know. Where’s Nate Silver when you need him? If you enjoyed this post, you may also enjoy my book Why Is There Anything? which is available for the Kindle on Amazon.com. As a public service, I hereby present my findings on physics seminars in convenient graph form. 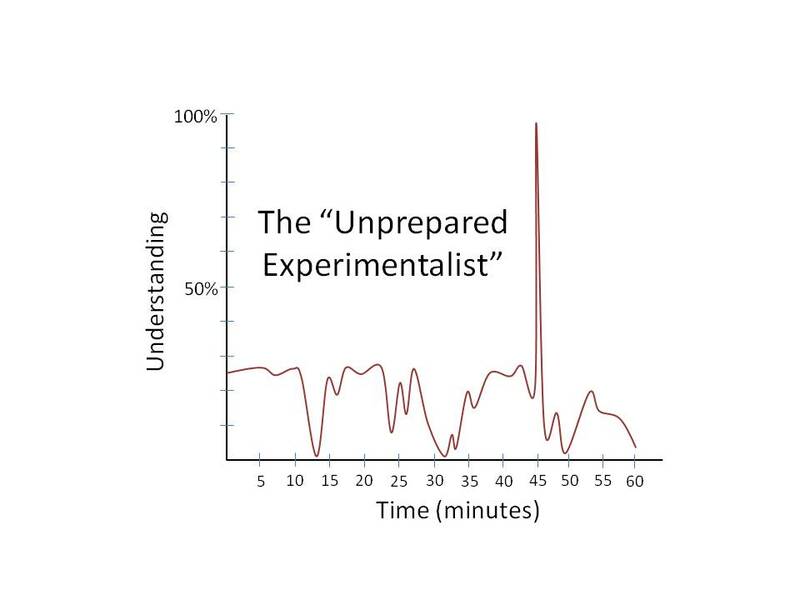 In each case, you will see the Understanding of an Audience Member (assumed to be a run-of-the-mill PhD physicist) graphed as a function of Time Elapsed during the seminar. All talks are normalized to be of length 1 hour, although this might not be the case in reality. The “Typical” starts innocently enough: there are a few slides introducing the topic, and the speaker will talk clearly and generally about a field of physics you’re not really familiar with. Somewhere around the 15 minute mark, though, the wheels will come off the bus. Without you realizing it, the speaker will have crossed an invisible threshold and you will lose the thread entirely. 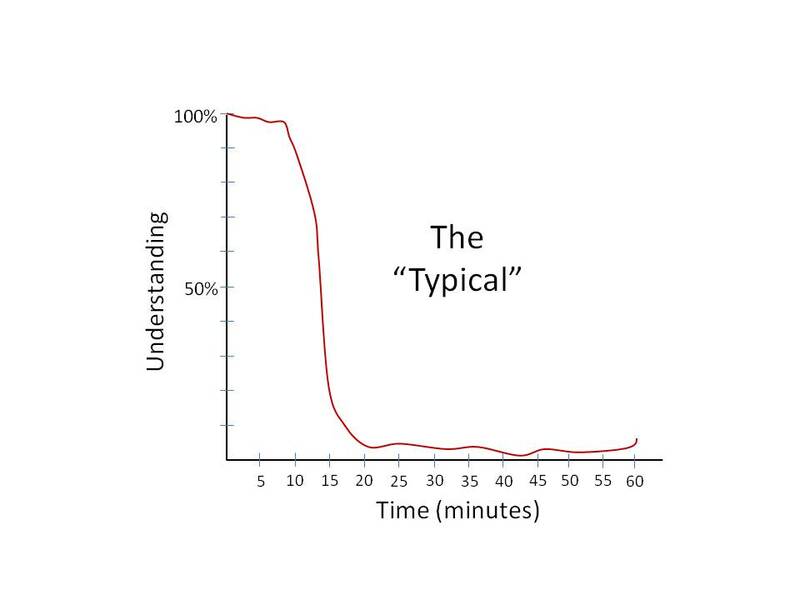 Your understanding by the end of the talk will rarely ever recover past 10%. 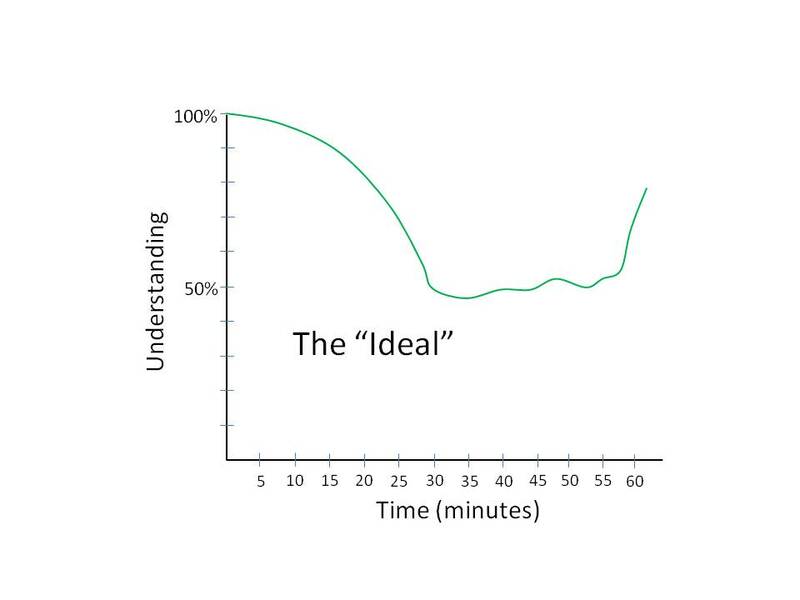 The “Ideal” is what physicists strive for in a seminar talk. You have to start off easy, and only gradually ramp up the difficulty level. Never let any PhD in the audience fall below 50%. You do want their understanding to fall below 100%, though, since that makes you look smarter and justifies the work you’ve done. 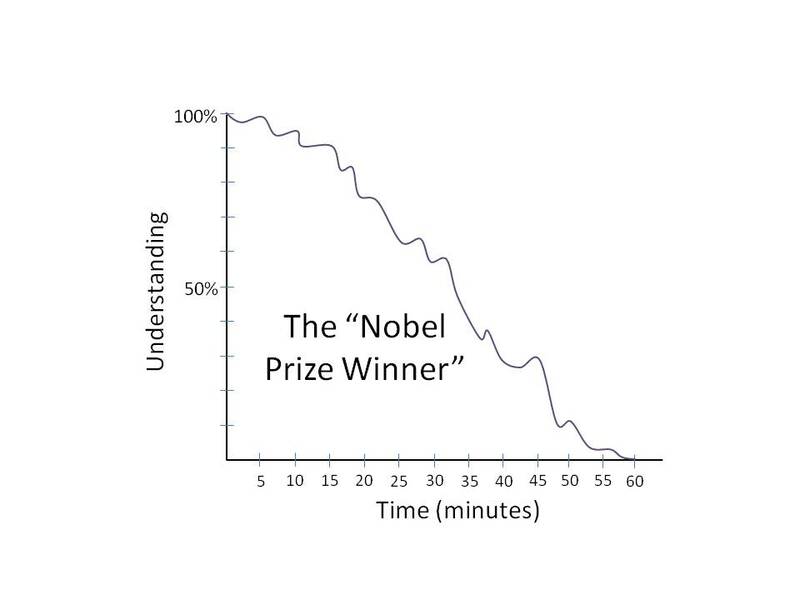 It’s always good to end with a few easy slides, bringing the audience up to 80%, say, since this tricks the audience into thinking they’ve learned something. 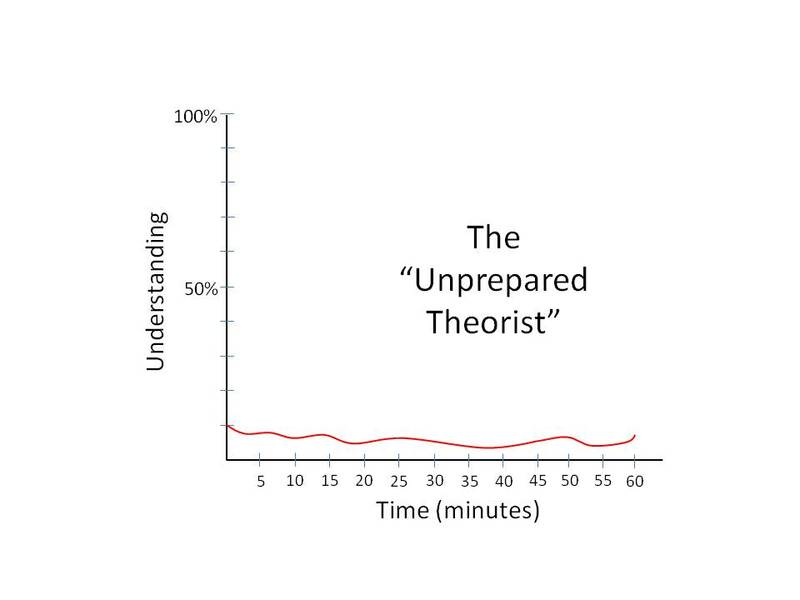 The “Unprepared Theorist” is a talk to avoid if you can. The theorist starts on slide 1 with a mass of jumbled equations, and the audience never climbs over 10% the entire time. 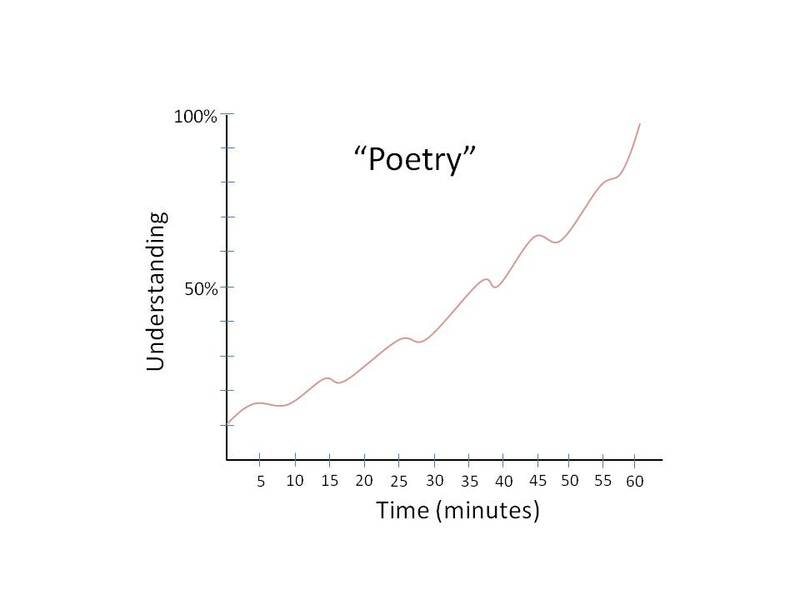 There may very well be another theorist who understands the whole talk, but interestingly their understanding never climbs above 10% either because they’re not paying attention to the speaker’s mumbling. You have to root for undergraduates who are willing to give a seminar in front of the faculty and grad student sharks. 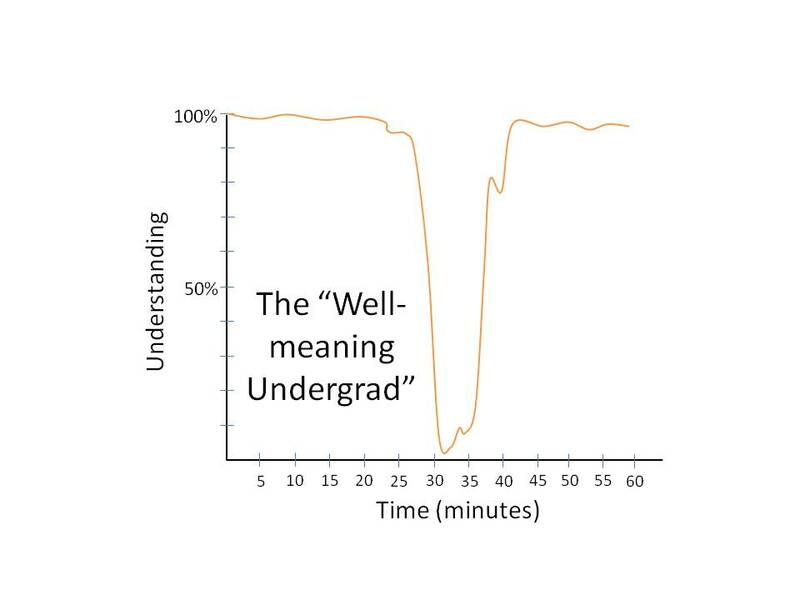 That’s why the “Well-meaning Undergrad” isn’t a bad talk to attend. Because the material is so easy, a PhD physicist in the audience will stay near 100% for most of the talk. However, there is most always a 10-20 minute stretch in the middle somewhere when the poor undergrad is in over his/her head. For example, their adviser may have told them to “briefly discuss renormalization group theory as it applies to your project” and gosh darn it, they try. This is a typical case of what Gary Larson referred to as “physics floundering”. In any case, if they’re a good student (and they usually are) they will press on and regain the thread before the end. 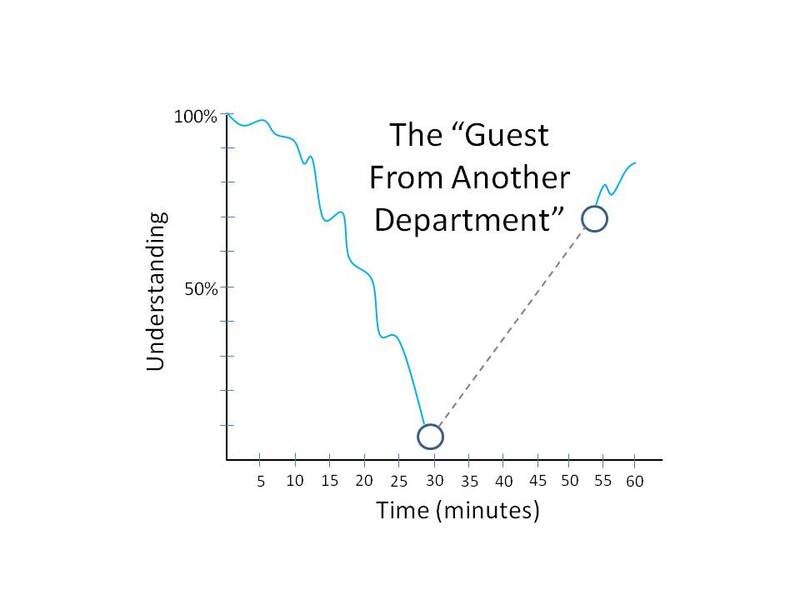 The “Guest From Another Department” is an unusual talk. Let’s say a mathematician from one building over decides to talk to the physics department about manifold theory. Invariably, an audience member will gradually lose understanding and, before reaching 0%, will start to daydream or doodle. Technically, the understanding variable U has entered the complex plane. Most of the time, the imaginary part of U goes back to zero right before the end and the guest speaker ends on a high note. The “Nobel Prize Winner” is a talk to attend only for name-dropping purposes. For example, you might want to be able to say (as I do) that “I saw Hans Bethe give a talk a year before he died.” The talk itself is mostly forgettable; it starts off well but approaches 0% almost linearly. By the end you’ll wonder why you didn’t just go to the Aquarium instead. The “Poetry” physics seminar is a rare beast. Only Feynman is known to have given such talks regularly. The talks starts off confusingly, and you may only understand 10% of what is being said, but gradually the light will come on in your head and you’ll “get it” more and more. By the end, you’ll understand everything, and you’ll get the sense that the speaker has solved a difficult Sudoku problem before your eyes. Good poetry often works this way; hence the name. 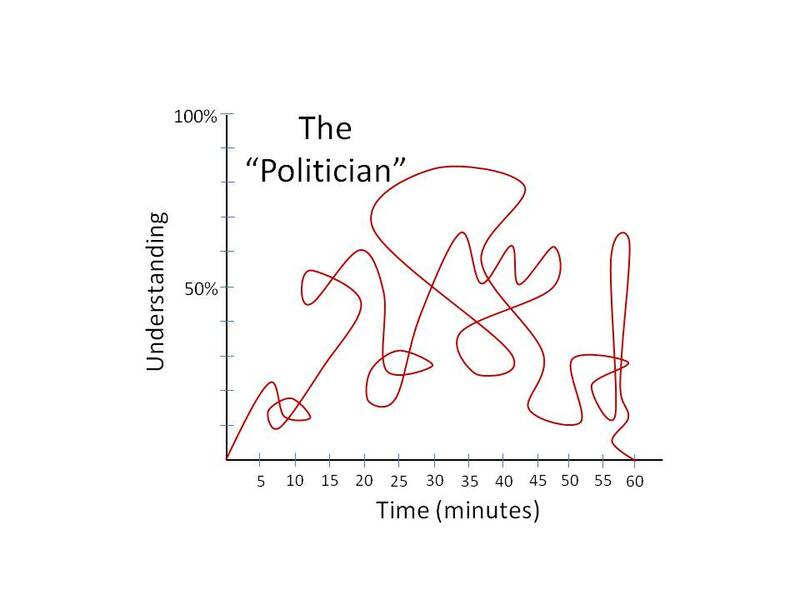 The less said about “The Politician”, the better. The hallmark of such a talk is that the relationship between understanding and time isn’t even a function. After the talk, no one will even agree about what the talk was about, or how good the talk was. Administrators specialize in this. If you enjoyed this post, you may also enjoy my book Why Is There Anything? which is available for the Kindle on Amazon.com. The book is weighty and philosophical, but my sense of humor is still there! 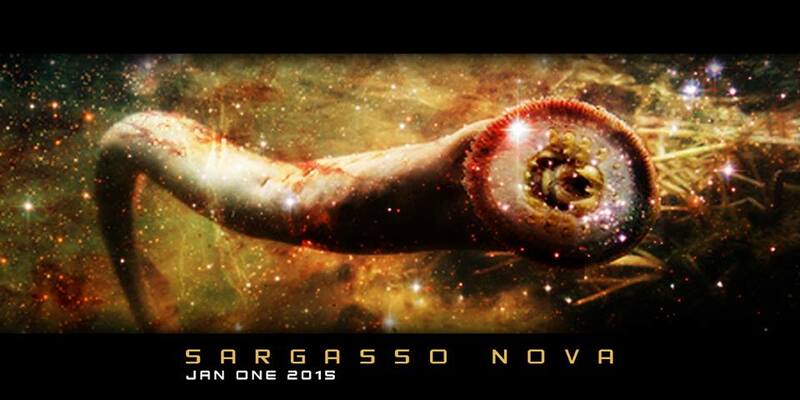 I am also currently collaborating on a multi-volume novel of speculative hard science fiction and futuristic deep-space horror called Sargasso Nova. My partner in this project is Craig Varian – an incredibly talented visual artist (panthan.com) and musician whose dark ambient / experimental musical project 400 Lonely Things released Tonight of the Living Dead to modest critical acclaim a few years back. Publication of the first installment will be January 2015; further details will be released on our Facebook page, Twitter feed, or via email: SargassoNova (at) gmail.com.